Super Smash Bros. for Nintendo 3DS (大乱闘スマッシュブラザーズ for Nintendo 3DS, Great Fray Smash Brothers for Nintendo 3DS) is one of two games in the Super Smash Bros. series released as part of the Super Smash Bros. 4 pair, and the handheld counterpart to Super Smash Bros. for Wii U. Although most gameplay elements are shared between the two versions, there are several elements which distinguish the two. The game is playable on the Nintendo 3DS in full stereoscopic 3D. It is the first Smash title to be released on a handheld. 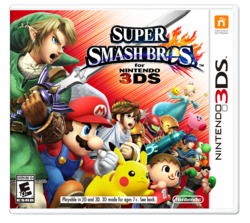 Super Smash Bros. for Nintendo 3DS was released on September 13, 2014 in Japan, and was released in most other parts of the world on October 3, 2014. The game was released in stores one day earlier in Germany on October 2, one day later in Australia on October 4, in Hong Kong and Taiwan on July 24, 2015, and in South Korea on September 10, 2015. The playable roster is the same between both versions of SSB4. Bold denotes unlockable characters in both versions. Bolded italics denote unlockable characters in the 3DS version only. The main menu of the 3DS version. Smash Run, a mode similar to City Trial from Kirby Air Ride, is exclusive to the 3DS version. Characters spend five minutes fighting enemies from various game series and collecting powerups, which are then active during a battle at the end. Optional dark outlines around playable characters are present in the 3DS version in order to make characters stand out more on the small screen. The outlines can be set to thick or thin, or turned off completely. The 3DS version features different collectible trophies than the Wii U version, with a greater focus on elements from handheld games. The 3DS version has only two musical tracks per stage, similar to the alternate music in Super Smash Bros. Melee. In the 3DS version, players can tap on a character's icon on the bottom screen to place a marker on that character on the top screen in order to more easily follow their movements. It follows characters even when they're invisible, with the exception of Greninja's Shadow Sneak and Substitute. The 3DS version features StreetPass functionality as part of the StreetSmash mode. The 3DS version has a new sound test feature that lets players listen to music in the game while the 3DS is in Sleep Mode. The demo is restricted to Vs. Mode only and allows only Mario, Link, Pikachu, Villager and Mega Man as playable characters, with Battlefield (normal form and Ω form) as the only available stage. Rules cannot be adjusted from two minute time matches. Both fighting against AI and local multiplayer are possible. The only mode available outside of regular battles is the Tips section, which provides gameplay tips. These tips also appear on loading screens. On September 9th 2014, the demo was made available on the Japanese Nintendo eShop. On September 12th, 2014, download codes for the demo were sent out to selected members of Club Nintendo Europe and Platinum members of the United States Club Nintendo; on September 12th, 2014, download codes were sent out to selected members of Club Nintendo Australia and New Zealand; recipients of the download codes received four each, to promote the games' four-player multiplayer feature. The demo was made available on the eShop without a code on September 19th, 2014, but unlike the download code demo, it has a limit of 30 plays. Reviews of Super Smash Bros. for Nintendo 3DS have been mostly positive, with Famitsu giving the game an almost perfect score of 37/40. This version of the game alone managed to sell over 1 million copies during the first weekend after its launch in Japan. As of October 7th, 2014, the game has sold 2.8 million copies worldwide. As of December 2015, the game has sold 6.78 million physical units worldwide, making it the better-selling of the two versions of Super Smash Bros. 4. Despite this, the game has minimal tournament representation, as Super Smash Bros. for Wii U shares its gameplay and mechanics but is largely seen as the more accessible version for tournament play due to its multiple control schemes and more clearly visible graphics. In addition, the handheld nature of the 3DS version greatly increases the possibility of lag in local wireless play, since no two players can play on the same system, unlike the Wii U version. Nonetheless, the 3DS version remains popular for online play, for which it suffers from fewer drawbacks compared to the Wii U version than for local multiplayer. However, many people were also upset that Ice Climbers were left out of SSB4, and the reasoning was because the 3DS wasn't capable of handling them. This along with several other factors that limited both versions caused a backlash against the 3DS version with many people wishing they only made a Wii U version so that Ice Climbers and other features would not have to be cut. A flourished excerpt from the main menu theme of Smash 4 that plays when either the game or the Smash Controller app is highlighted on the 3DS HOME Menu. It can also be heard on the Wii U upon starting the game from the HOME Menu or Quick Menu. A Smash 3DS bundle available on the Nintendo UK Online Store, featuring a shirt and sweatband. Super Smash Bros. for Nintendo 3DS has the most series represented by stages but with no characters, at five. Super Smash Bros. for Nintendo 3DS is the first game in the series to lack an appearance of Ridley, an opening, Classic/All-Star ending movies and a new stage from the Donkey Kong, Metroid, Yoshi, and Star Fox universes. Because of the amount of RAM that Super Smash Bros. for Nintendo 3DS uses, it cannot run alongside other programs on the 3DS that use the internet. However, this does not occur on the 3DS' successor, the New Nintendo 3DS, due to the latter system having larger RAM. Super Smash Bros. for Nintendo 3DS marks the first appearances on a portable system for Shulk, Wii Fit Trainer, and Bayonetta, and the only handheld appearance for the latter two. This is also the first appearance on the 3DS for Ness, Zero Suit Samus, and Olimar. This is the only appearance on the 3DS for Lucas, Mr. Game & Watch and Duck Hunt. In a similar vein to Brawl's introduction, when starting up Super Smash Bros. for Nintendo 3DS, the roster of characters is shown, appending any unlocked or downloaded characters to the lineup as well. Each character actually has three models: a detailed one for trophies, the results screen and when the game is paused, and a model with lower polygon count for when the game is in motion. This is more noticeable in Training Mode when the player zooms in on the character and sets the speed to half or quarter speed when L is held. Super Smash Bros. for Nintendo 3DS is the only game in the series to not support the GameCube controller in any way, though it can be used by hacking. Super Smash Bros. for Nintendo 3DS is the first (and currently only) game to have a downloadable demo prior to release. Rainbow Road and Pac-Maze are the only two new stages from this game, excluding Battlefield and Final Destination, to not be featured in Ultimate. This page was last edited on April 8, 2019, at 05:56.